One of the oldest bicycle companies to form in America, Schwinn was launched way back in 1895, in Chicago Illinois, USA. 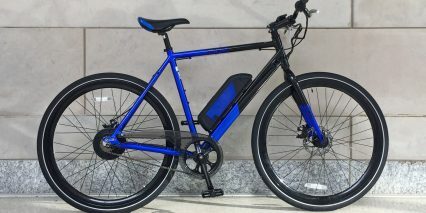 These days, it’s part of a conglomerate called the Pacific Cycle group, and is expanding into electric bikes with products such as the sporty Schwinn Monroe 350. 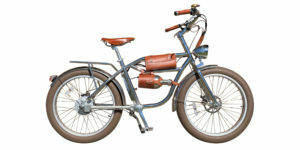 It has been interesting to watch Schwinn over the past decade, because they were one of the earliest entrants into the ebike space in 2007 with the World GSE model. Compared to that bike, the Monroe 350 is 25% less expensive, a lot lighter weight, and much more streamlined. 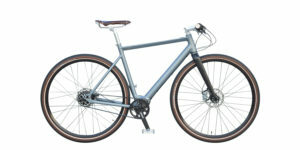 It comes in three frame sizes and features color-matched fork, grips, saddle, and stylish deep dish rims. 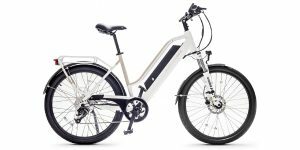 It would be perfect for city riding because its single-speed drivetrain won’t get bumped out of alignment easily at racks, the battery is removable for charging and safe keeping, and the display is compact and simple. 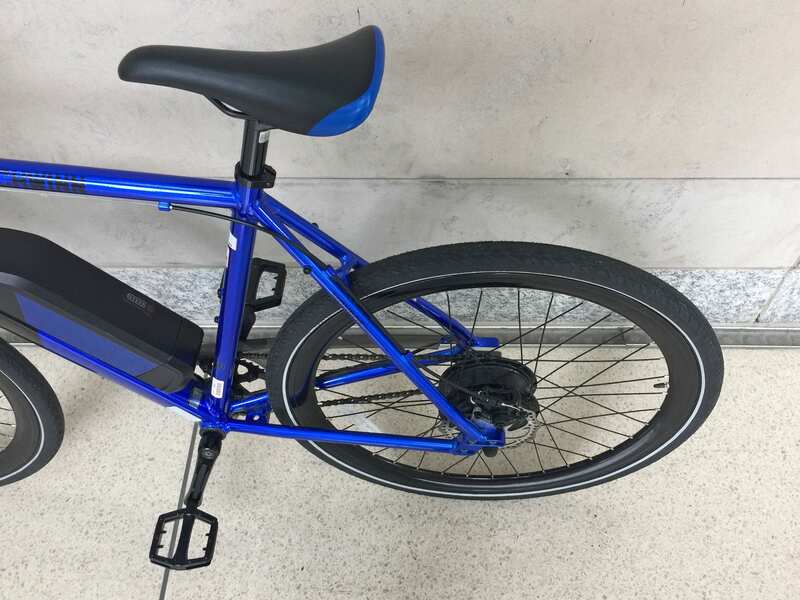 You could lock this thing up to a bike rack and not have to worry so much about scratches and bumps… except for the power cable that protrudes from the right rear axle. 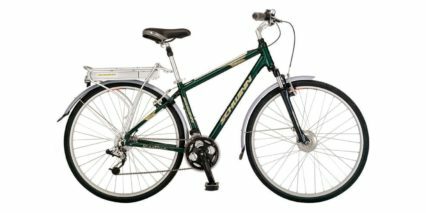 For those who are truly concerned about damage or theft, consider the cheaper Schwinn Monroe 250 which isn’t as powerful, but costs $300 less and still looks great. Perhaps you’re the type of person who lives up stairs and wants to store the entire bike inside? That’s going to be easy with either of these e-bikes because of the wide open triangle and straight top tube. 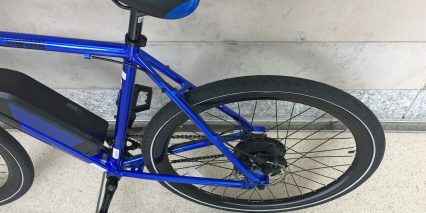 The bike is very well balanced front to rear and even has enough room inside the triangle for a bottle cage mount, which could also work for a folding lock, mini-pump, or other standard accessory. The trade-off here is that the frame feels more rigid and positions your body in a more forward leaning sporty angle… even mounting the frame requires a flexible sporty mindset compared to a mid-step or step-thru. This is especially true if you add a rear rack or fenders because you’ll have to swing your leg even higher. And, compromises were made to keep the price low. The Monroe 350 uses mechanical disc brakes vs. hydraulic activation with smaller 160 mm rotors vs. 180 and the motor is more efficient and smooth than truly powerful. 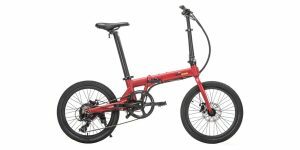 It’s a big step up from the Monroe 250 (which uses a 250 watt motor) but you’ll still have to pedal along when climbing steep hills. 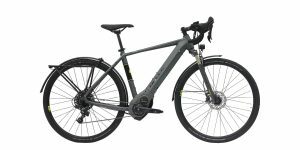 There’s also no throttle here, which makes this a Class 1 product and allowable on more trails and paths but with only one gear and a cadence sensor, it requires a bit more pedal power and time to start. 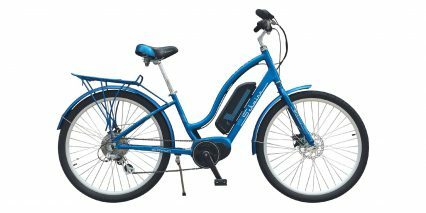 Driving this bike is a very standard, highly recognized, 8Fun 350 watt internally geared hub motor. It’s compact, durable, and fairly quiet in the lower three assist levels. 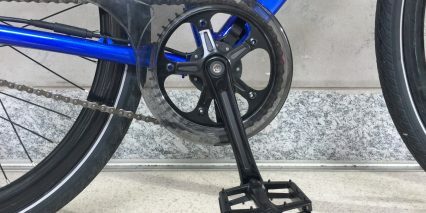 It blends in with the black spokes and deep dish rims visually and is not so heavy as to weigh down the back of the bike and impact riding or lifting of the frame. 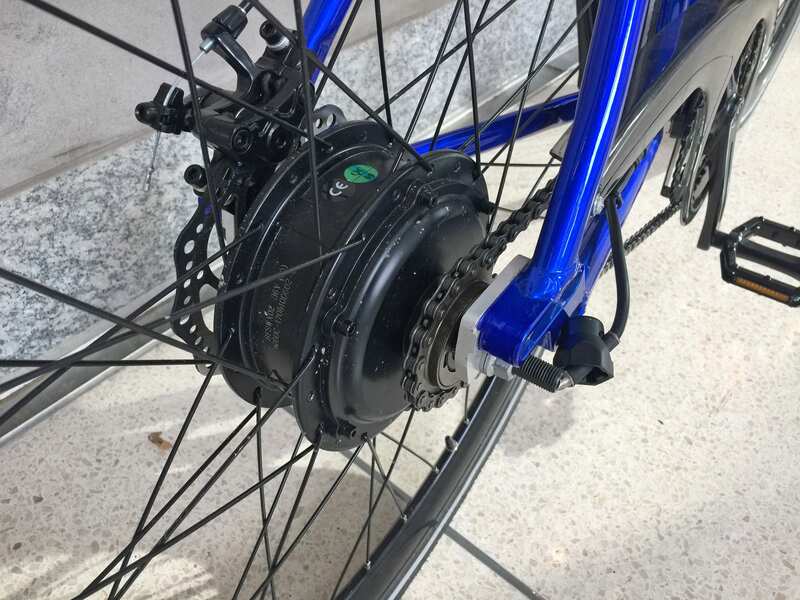 The motor responds quickly to pedal assist once the bike is moving a bit, because there is only one gear and the first pedal strokes can be slow and more difficult to make. 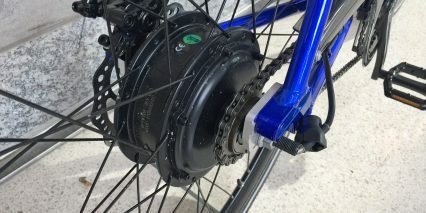 Many of the early electric bicycles I tested in 2012 and 2013 used low resolution five or six magnet sensors but the Monroe 250 and 350 have opted for a high-precision 12 magnet cadence sensor. This means that even though the motor won’t start instantly (for lack of a torque sensor) it will start and stop quickly enough to be safe and satisfying. During my ride tests, I found the most comfortable speed to pedal at was around 15 miles per hour. Riding slower than this had a slow lumbering cadence and around 20 mph I was having to spin quickly to keep up. An interesting characteristic of cadence sensors however, is that you don’t need to push hard in order to activate them… just keep turning the cranks and the motor will stay active. 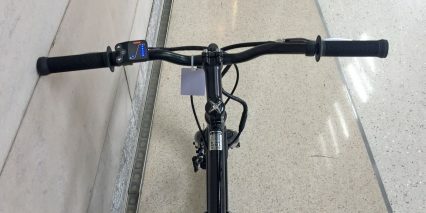 I love that both brake levers have motor inhibitor switches built-in to cut power instantly when you need to stop or want to track stand at a stop sign or traffic signal. One complaint I have about the motor design is that the power cable entry point is a little exposed on the right axle. 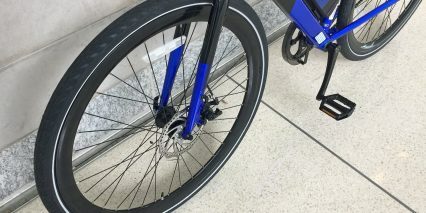 There is a rubber cap to help protect it, but the cable still protrudes a bit and could get snagged or bent and damaged if the bike were to tip onto its right side. 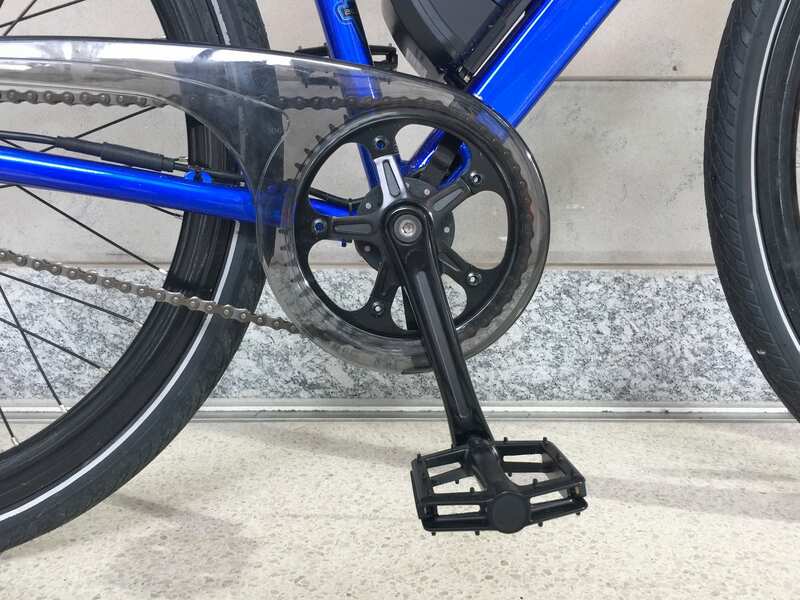 There is a kickstand mounting point just behind the bottom bracket, but I anticipate that if you add a stand here, it will block the left pedal when deployed, occasionally getting in the way when you park and maneuver the bike. I personally prefer rear mounted stands… but I see lots of city bikes that come just like this, with no stand! And the idea seems to be weight savings and quiet. 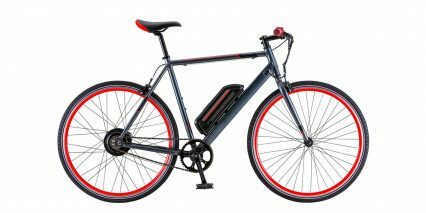 Powering the motor and LED display console on this model is an above average capacity 36 volt 14 amp hour battery pack that mounts directly to the downtube with three bolts! 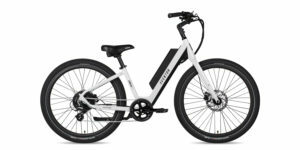 So many of the cheaper ebikes I test have batteries that just use two bolts and clip down from above vs. sliding in from the side… so I really feel that Schwinn made a good choice with this pack. 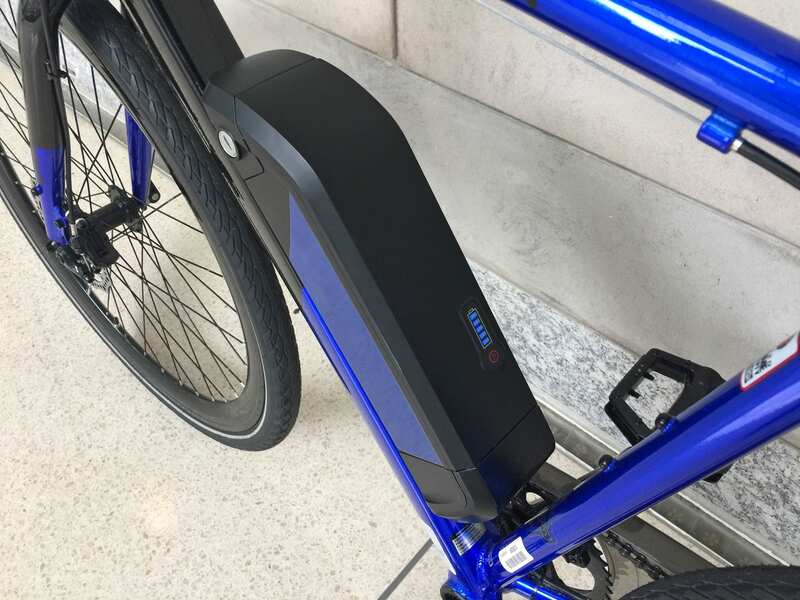 It has a nice rubber cover to protect the charging port on the right side and an integrated LED charge level indicator to help you determin how full it is, even when stored separately from the bike itself. The battery locks securely to the mount and its casing has a bit of a lip near the top for secure lifting and carrying. This pack weighs around 5.7 lbs which is less than half a pound more than the smaller 11.6 amp hour pack used on the Monroe 250 model. I love how it’s positioned low and center on the frame to improve stability and provide room for the bottle cage bosses and a space for you to lift and hang the frame on some car and bus racks. However, please do be careful of the wire brake line running along the base of the top tube if you try to lift this bike, because it could get snagged or rub into the frame and scratch it over time. Many of the other wires, for the electric assist and control systems, are internally routed through the frame. This design choice makes the bike look nice and provides a bit of added protection but could make it harder to work on. 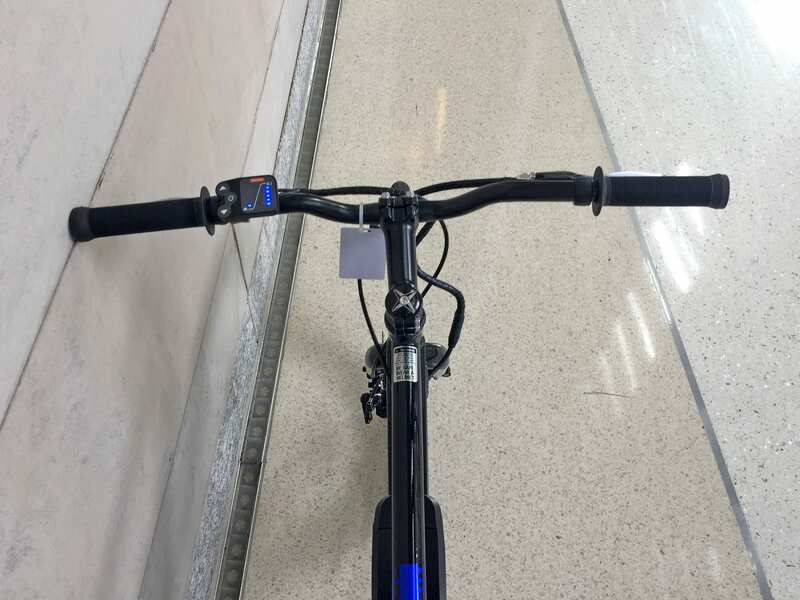 It would be nice if there was a USB charging port somewhere on the bike, to use for your smartphone or lights, but at least the tires have reflective sidewalls and there’s plenty of room on the handlebar for mounting your phone and a rechargeable light separately. 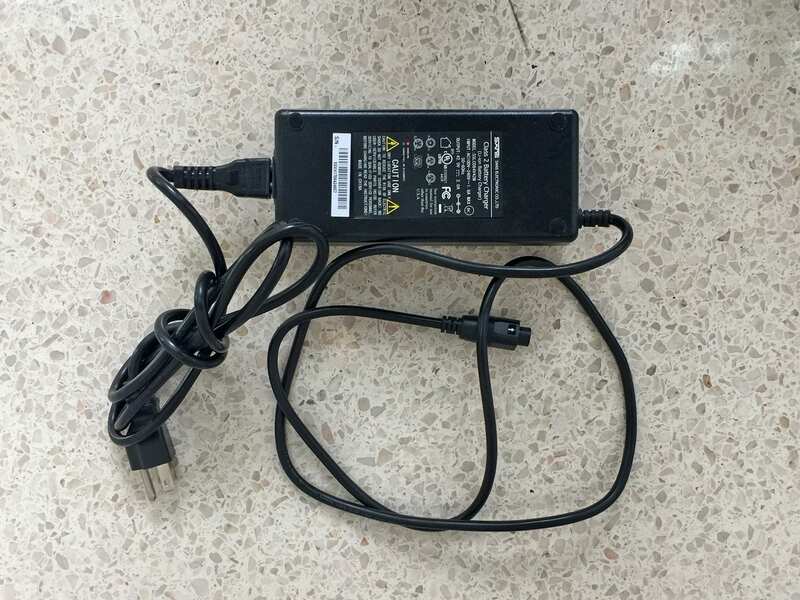 The charging port on the battery pack is low on the right side, which puts it near the right crank arm and creates another minor point of vulnerability, just be careful… the charger delivers 2 Amps, which is very average and should take 5.5 to 6 hours for a full refill. The control panel design used on this electric is incredibly simple and streamlined. Once the battery pack has been filled and properly mounted to the frame, you just hold the power button on the control pad near the left grip, and it blinks to life with a little dance of lights. There are two menus here, the left chart shows five dots that indicate 0-5 level of pedal assist. The higher you go, the zippier and faster the motor will spin but it will also draw more power, depleting your battery more quickly. The second chart is a battery level indicator showing five dots, each representing a 20% drop. 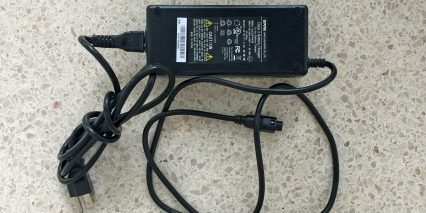 This chart resembles the five square LED lights on the top of the battery pack. So, the display itself is encased in black plastic and has sealed buttons built in that seem well protected from water and dust. 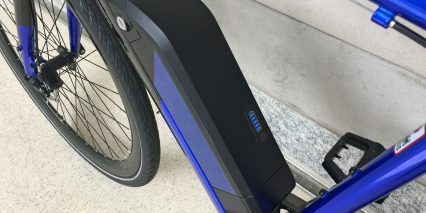 It does leave something to be desired when you have experienced fancier ebike products, but it definitely gets the job done. You won’t see your speed, average speed, trip time, odometer, trip meter, range estimate, or any other fancy stats… just your power level and battery level. The buttons were easy enough to reach and press, and I like how the black casing of the display blends in with the black handlebar and matches the black spokes, chainring, pedals, and even the hub motor casing. It’s all matched and tough looking, and perhaps that will help it blend in at the rack so people don’t mess with it or even notice that it’s something different (especially if you take the battery pack off). The one thing I was conflicted about was how bright the blue LED lights were on this display. They worked fine in broad daylight, but at night, it could be annoying or even distracting… so I have used masking tape to dim this sort of light on my own electronic devices before, and I offer that as an inexpensive way to tone down the brightness if you like. 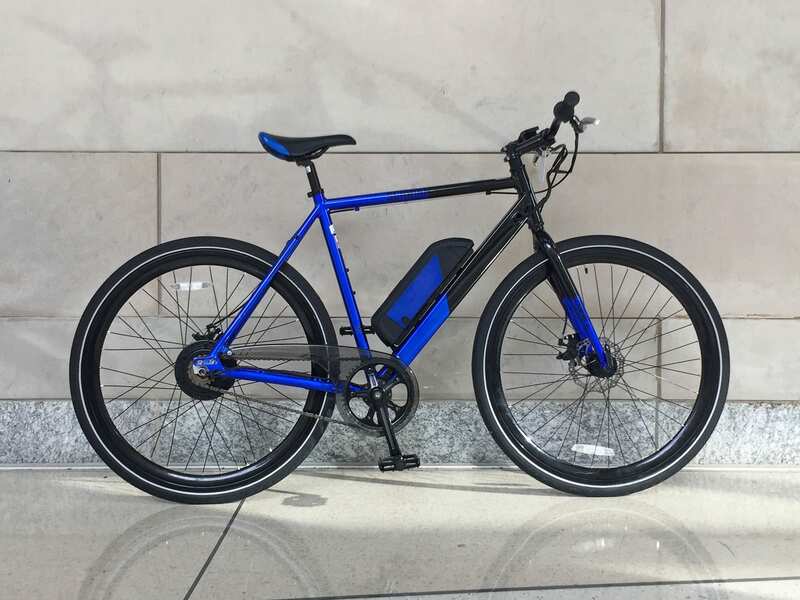 For this review and the Monroe 250, I was able to borrow demo bikes from the Schwinn team at the Electric Bike Expo in Philadelphia. It was a medium sized frame and I am ~5’9″ tall weighing about 135 lbs. In order to get some up-close motor shots, I mounted one of my cameras to the frame. Aside from the higher capacity battery and more powerful motor, the bikes were very similar and both priced affordably, but not as cheap as off-brand products. 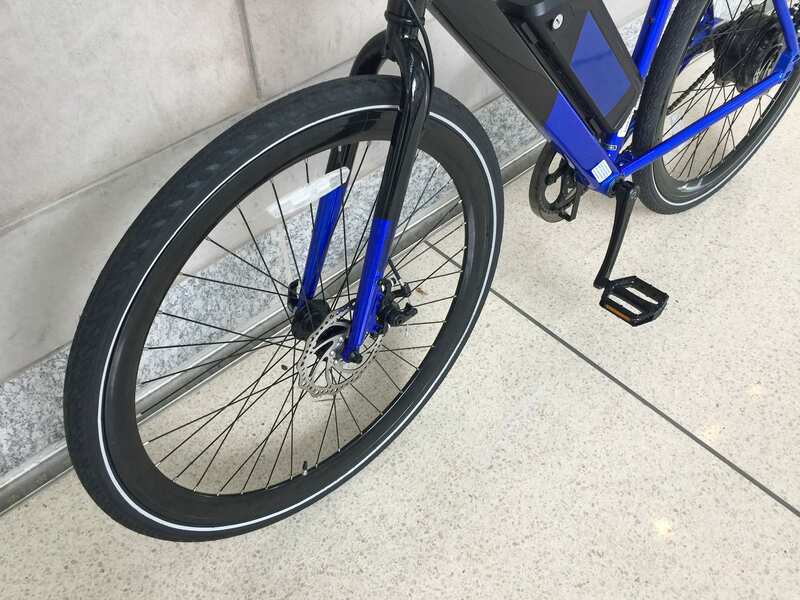 It sounds like the Pacific Cycle group is committed to delivering good customer service and I definitely noticed an attention to detail with this ebike, such as the thicker rear spokes to handle the added weight and forces of the motor. 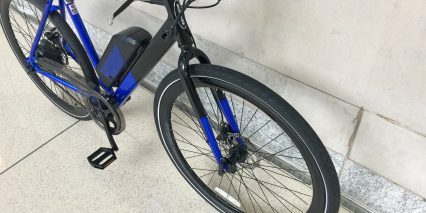 This is a sporty, less comfortable electric bike, with a forward leaning geometry and long stem (which could be flipped and lowered to get even more aerodynamic. I think it would be perfect for young city goers who need something fun and reliable that’s easy to carry upstairs. 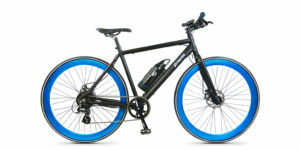 At the end of the day, this electric bicycle may cost a bit more than $1.5k because of shipping. 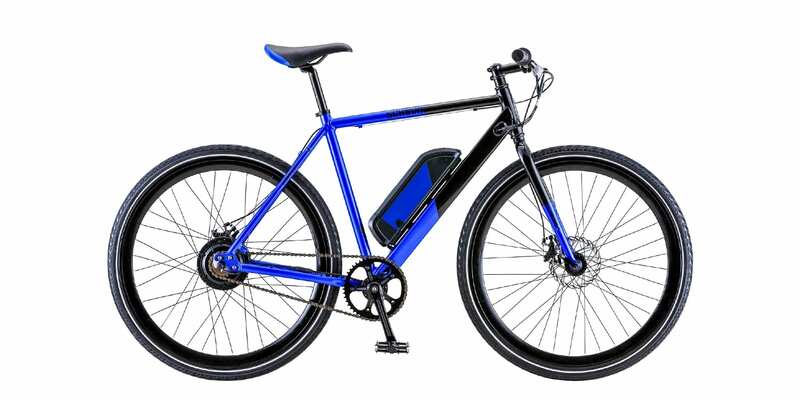 While researching this e-bike, I found only very limited information on the official Schwinn web page and had to rely a bit on their catalog but mostly on my own first-hand experience. I hope that all of the specs I gathered above help you, and I invite you to provide your own insights and feedback about the bike. 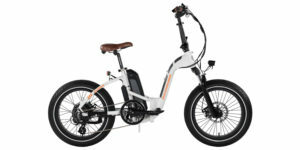 It reminded me of the Easy Motion EasyGo Race in terms of style, price, and power. However, that product has a much lower battery capacity. If I were to purchase this thing for myself, my first upgrade would be a 27.2 mm suspension seat post like this, just to take the edge off, and I would definitely appreciate the slightly wider and lower PSI tires on this model vs. the Monroe 250. 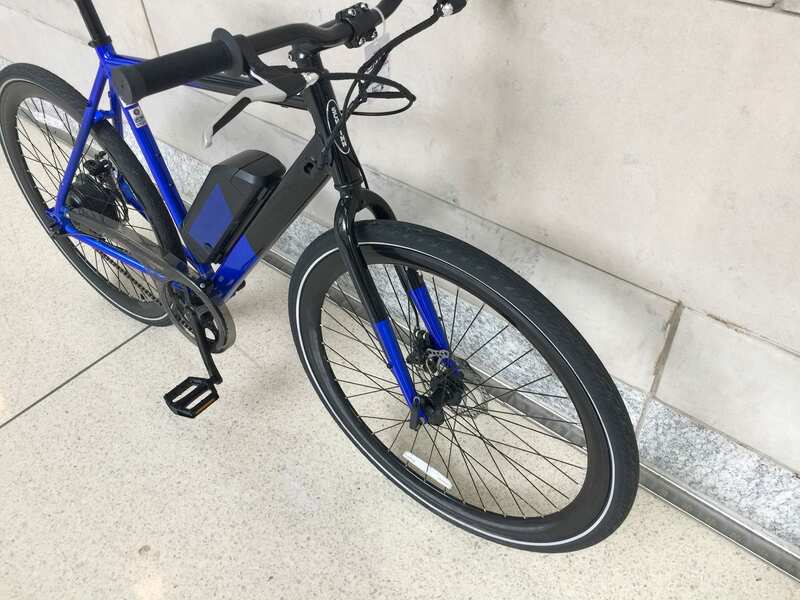 Big thanks to Schwinn for partnering with me on this review, allowing me to cover several of their models back to back and to the Ebike Expo coordinators for allowing me to hang out. 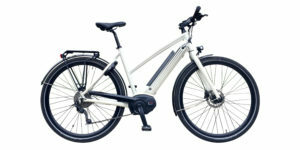 As always, I’ll do my best to answer comments posted below and you can interact more on the Schwinn Ebike Forums.